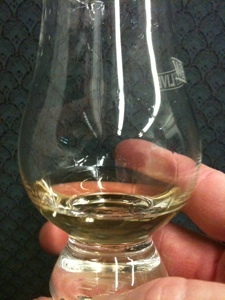 Longrow is Springbank's peated expression. The 18 year old expression made a couple of appearances in the 90s and then disappeared, apparently gone for good. John Hansell reported the fitful return of the 18 OB expression in 2008 which was received with fanfare. Sadly I didn't get a chance to taste it. The next release after 2008 was the 2011 release reviewed here. The next one isn't until 2013 and regular releases will not begin until 2015. Such is the difficulties in ramping up production runs of very old whiskies. Color: straw yellow - pale like white wine. Pinot Grigio, maybe. This is shocking color for a whisky from a sherry cask of this mature age. Obviously they chose a set of well used multiply refilled casks - deliberately. Nose: Very closed at first with indistinct sweet spirity aromas but with 10-15 minutes of air a flower garden blooms: dusky rose, lilies, honeysuckle, and white pear. Perfumer's notes of lanolin and faint ambergris, butter and salt (but a clean mineral salt - not ocean spray) follow and then a clear and pervasive backdrop of chalk mineral. With much extended time some sour wine aromas begin to show so 10-45 minutes is the sweet spot. During this window the nose is absolutely glorious. As close to perfume as any malt in my experience. That the window closes and sourness intrudes makes this seem even more like a delicate hothouse flower that must be enjoyed while fresh. Entry picks up the perfumed Highland/Spey fruit basket with a delicate off-dry entry that turns sweet with vividly floral honeysuckle flavors and green apple, and white pear fruits at midpalate. The sweetness doesn't seem like actual tongue hit of wood sugars - but more of an olfactory effect of the perfume floral sweetness interacting with more slight sweetness on the tongue. The mouth feel is light as a feather, but not watery or thin. Gentle heat shows up at the turn to the finish - a slight peppery glow. The finish is remarkably long for such a finely dressed slender pale white lady with honeyed grain mash and subtle furniture oak and gentle musk. There is very little tannin influence for a dram of this age. A few drops of water releases musky notes in the nose and puts a bit of citrus in with the pear aromas. On the tongue there's a bit more honey sweet and some malt and grain flavors and a bit more spicy heat but the focused floral quality has become less distinct. I'd skip the water on this one unless you have extra time for integration. (The focus returns over hours of marrying time). More than a few drops threatens to turn "delicate" into "thin and weak". So where is all that peat? 50ppm is close to Port Charlotte range. This could be a fire breather - but instead it's a great delicate lady in pearls and perfume in a magnificent white size 00 gown. Where is the sherry? Tasted blind I would guess this might be a great Speyside or Northern Highland malt. This is a brilliant deceiver - a deft act of distillitory legerdemain. As such I'm puzzled, mystified, and delighted. It's certainly delicious, but risks being a bit too delicate for my tastes - particularly at this price. Longrow 18 is a rarity that commands between $170-$200. That being said I'm very glad I had the opportunity to taste it. That does sound like an odd beast. Given how peat-driven Longrow CV is, I'm pretty shocked that the phenols would have almost disappeared, even in an older whisky. Makes me wonder if this is something they'll be able to replicate consistently or if it's a particular set of barrels that were pulled together to make this peculiar whisky. "It’s only after quite a few seconds that the ‘usual’ sooty, greasy, mineral and musty notes do arise, as well as whiffs of beach sand, seaweed and those clean wet dogs that we all like quite a lot, don’t we? The peat smoke makes a late arrival, together with notes of walnuts and a little nutmeg." "It shows a kind of gentle peatiness and balance that reminds me of some of the best (though much older) Port Ellens. Mouth: oily, with a slightly sharp peatiness." Now, I got some muskiness, particularly when I added a drop of water. However I didn't get the maritime airs and the smoky flavors those two extremely distinguished top bloggers got. It makes me wonder whether either the bottle or the particular samples I received might have had some variation or extra oxidation before I got to drink them. My palate is usually pretty sensitive to peat. I've only been able to find a couple of sources but, Port Charlotte is peated to 40ppm. I've been told that Ardbeg is peated to 50ppm though. Right. And Port Charlotte is some seriously peated whisky. PC6 is among the most intense peat encounters I've had, subjectively right up there with Octomores or Ardbegs. Lagavulin tastes extremely peaty and it too and it is peated at around 35ppm - so peat level alone isn't telling the full story. Longrow 18 didn't show its peat to me except as a musk. Perhaps it also was present in the wineyness, and some bitter influence. It didn't come off as peat. What shone was the fruit and floral which isn't what you'd expect of a peated dram at all. Weird - but kind of weird and wonderful. 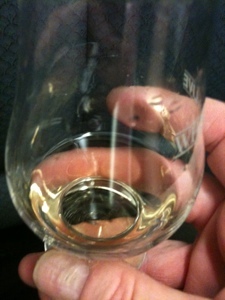 Springbank & Longrow have a delicate/fruity peat, not islay peat. It's more than peat for peat's sake, instead it is more integrated with the malt. This takes some getting used to. I've got both the 2008 and 2011 bottlings of this, and both are superb. I think one problem is that you cannot judge a whisky via a tiny 30cl sample. You need to sit down with several drams over a week or two, and allow for some oxidation in the bottle. Thanks for a great review however! 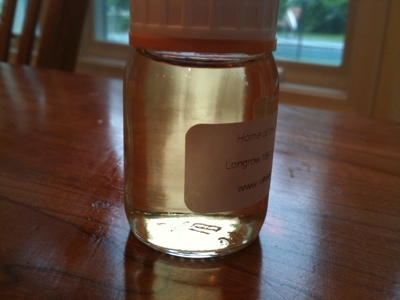 You are 100% right about the integration of peat into Longrow - and also the need to have more than just a single 3cl sample. When reviewing samples I usually try to have more than one sample. I like to do head to heads, add water etc... This particular time I only had one. Your point about oxidation in the bottle is valid too. Traded samples can also mislead because you don't know how long the bottle in question has been open (unless that is specifically discussed). 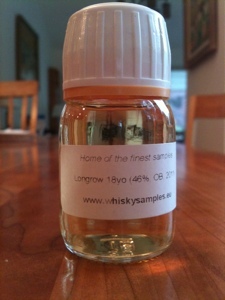 I consider my failure to "get" the peat in this review of Longrow 18 is one of my bigger failures as a reviewer. But I brought what I could and did the best I could with the circumstances I had. Josh, after trying Longrow 10 Year, I'm no longer shocked that the 18 Year would have hardly any peat. I found it amazingly diminished in comparison to the CV, so it seems that some combination of Springbank's location and their casks makes their whisky lose peat reek pretty quickly. I'm mentally readjusting my expectations for what the 14 Year is going to be like.